The final import numbers for 2017 are in and the news is very positive. Premium cigar imports are at a level not seen in the United States since 1998, in the waning days of the cigar boom. Last year, 330 million premium cigars were shipped to the U.S., according to the Cigar Association of America. Not only was 2017 the biggest import year in almost two decades, it was dominated by Nicaragua, which enjoys its second year as the largest supplier of premium cigars to the United States, beating out the Dominican Republic once again. Premium cigar imports were up 2.4 percent over 2016, which amounts to nearly 8 million more premium cigars. This is the third year in a row imports into the U.S. have grown, increasing steadily since 2015. To give some perspective, annual imports were well below 300 million premium cigars from 1999 to 2011, with spikes in 2004 and 2005 (286.5 million units and 297.8 million units, respectively). Imports climbed back up to the 300 million mark in 2012, when 304.7 million premium cigars were shipped to the United States. The numbers have stayed over 300 million since. Perhaps an equally intriguing story is Nicaragua. According to the CAA’s yearly report, Nicaragua was the largest supplier of premium cigars to the U.S. in 2017, surpassing the Dominican Republic for the second year in a row. Last year, a little more than 148 million premium cigars made in Nicaragua came into the United States, nearly 30 million more (or 22.4 percent) than the Dominican Republic, which exported 118.5 million premium cigars to the U.S. market. Nicaragua’s prominent position in 2017 does not surprise Nestor Andrés Plasencia. His family-owned company, Plasencia Tobacco, is one of the largest growers of tobacco in Nicaragua. He produces Nicaraguan cigars at his namesake factory as well, including the Plasencia Alma Fuerte Generacion V, which was the No. 9 cigar of 2017 by Cigar Aficionado. Numbers have been adjusted to remove estimated shipments of machine-made cigars. There was a time not very long ago when Nicaragua wasn’t even a factor in the premium industry. The country’s products were prohibited from being sold in the U.S. due to an embargo from 1985 to March 1990, and war ravaged the country’s infrastructure. As a result, the nation exported fewer than 1 million cigars annually to the U.S. between 1991 and 1995. Even small countries like Jamaica produced more premium cigars. By 2000, Nicaragua had pulled into third place, but still trailed far behind Honduras. As infrastructure in Nicaragua improved, so did its tobacco, and consequently, its cigars. Smokers took notice, as did Cigar Aficionado, which has named a Nicaraguan smoke the Cigar of the Year seven times—more than any other country. Nicaragua’s growth since 2004 has been, for the most part, steady. There were some ups and downs from 1997 to 2003, but 2004 started a predominantly upward trajectory from Nicaragua with a few notable spikes in production—one in 2008 (70.2 million cigars), one in 2011 (102.2 million cigars) and one in 2013 (nearly 119 million cigars). While the Dominican Republic had dominated U.S. imports for decades, Nicaragua was slowly closing the gap. By 2013, Nicaragua was a close second and by 2016, Nicaragua had finally pulled ahead to No. 1, knocking the Dominican Republic to second place. Cigarmaker A.J. Fernandez, who produces brands in Nicaragua such as New World and Enclave (plus a large portfolio of contract brands), has seen production go up in his company as well. Fernandez is referring to slow-drip irrigation systems that conserve water and, at the same time, bring hydration directly to the tobacco plants in controlled, slow-dripping intervals. Like the Plasencias, Fernandez is both a tobacco grower and cigar manufacturer, though on a smaller scale. Padrón Cigars has played a major role in elevating the status and demand for Nicaraguan cigars. In addition to consistently stellar ratings for its brands such as the Padrón 1964 Anniversary Series and Padrón Serie 1926, the company has won the Cigar of the Year accolade three times—more than any other cigarmaker. Conversely, the Dominican Republic has been struggling to grow since 2013. It exported 134.1 million cigars to the U.S. in 2012, but has receded, reaching a five-year low in 2016 at less than 116 million units. Despite the Dominican Republic falling to the No. 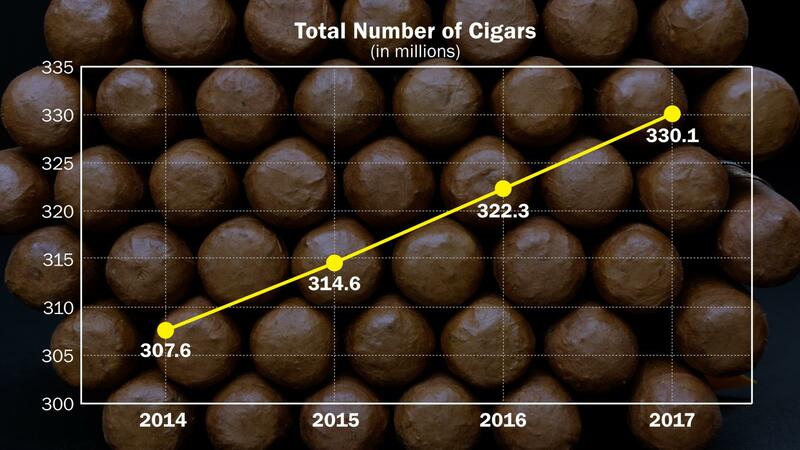 2 spot, it still posted positive growth in 2017 at more than 118 million cigars—an increase of almost 3 million units over 2016. That means that the U.S. market is still flush with plenty of Dominican cigars, such as Arturo Fuente, Davidoff, Macanudo and Montecristo. The majority of Dominican cigars exported to the U.S. come from four predominant factories: Tabacalera de Garcia (owned by Altadis U.S.A), General Cigar Dominicana (owned by General Cigar), Cigars Davidoff (owned by Davidoff of Geneva), and Tabacalera A. Fuente y Cia. (owned by Arturo Fuente Cigars). "Our production at Tabacalera de Garcia in the Dominican Republic has not decreased," said Javier Estades, president of Tabacalera USA, which owns Altadis U.S.A. "On the contrary, it continues to grow, in addition to the expansion of our footprint in Nicaragua. We are committed to having a significant presence in each of the countries of origin that we participate. It is clear that consumers are looking for different types of flavors and complexity, and Nicaragua provides another alternative." Honduras ranked third, having exported less than 62 million cigars to the U.S.—nearly 10 million less than 2016. The “Other” category on the table consists of imports from the Bahamas, Costa Rica, Mexico, Panama and the Philippines. Collectively, this category posted a gain of 475,000 cigars, or an increase of 45 percent. The figures are for shipments of premium cigars, not sales, but they are a positive indicator of the state of the American market, which has consistently imported more than 300 million premium smokes since 2012. The positive growth of 2017 is particularly impressive when considering the many challenges facing the premium cigar industry. In addition to the constant barrage of smoking bans and increased taxation, the premium sector still awaits some clarity from the U.S. Food & Drug Administration, which now has authority to regulate cigars. So far, the FDA regulations do not seem to have negatively impacted U.S. imports, but final costs regarding the FDA’s substantial equivalence and mandatory lab testing for chemical analysis are still undetermined. Note that Cuban cigars are not part of this year-end review. The embargo is still active. Though U.S. citizens can bring Cuban cigars into the country for personal consumption, the sale, importation or distribution of Cuban cigars in the United States is still illegal.